Book Simone for your wedding or special event. Simone is a professional wedding/special functions singer on the Amazing South Coast of Western Australia. 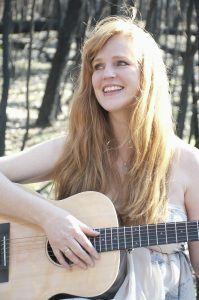 She is a WAMI award winning singer songwriter based in Albany WA. She won two categories in the one year (Most Outstanding Regional and Mentally Healthy) after five nominations for the Western Australian Music Industry Song of the Year, a first for a regional artist. She has released four albums. Simone specialises in singing songs chosen by a couple as part of their wedding ceremony. She can also compose original, unique songs, specific to a couple’s needs should they require a more personal touch. Whether it be a beach wedding, winery wedding, forrest wedding or a lavish church wedding, Simone’s quality and style creates an ambience all age groups can enjoy, from the younger family members through to grandparents. As well as her solo work, Simone performs as part of a trio consisting of guitar, vocal harmonies, violin and keyboards, suitable for both ceremonies and receptions. Sentimental tunes and timeless classics keep spirits high. Simone’s musical talent, versatility and professionalism make her an excellent choice for your special day.